The core is a functional system of stabilizing muscles that encompass your entire trunk. These muscles are involved in almost every movement of the entire body, with a main function of stopping movement at the spine, rather than creating it. As we move our limbs in various positions, the “core”, also known as our deep or local stabilizing system, musculature’s role is to stabilize and protect the spine. Meanwhile, our ‘global stabilizing system’ muscles transfer loads between the extremities while providing support, stability, and eccentric control of the core during functional movements. Together these two systems of muscles that must function together as a unit to truly protect the your spine. The local system muscles of the core lie deeper than your abs or obliques. 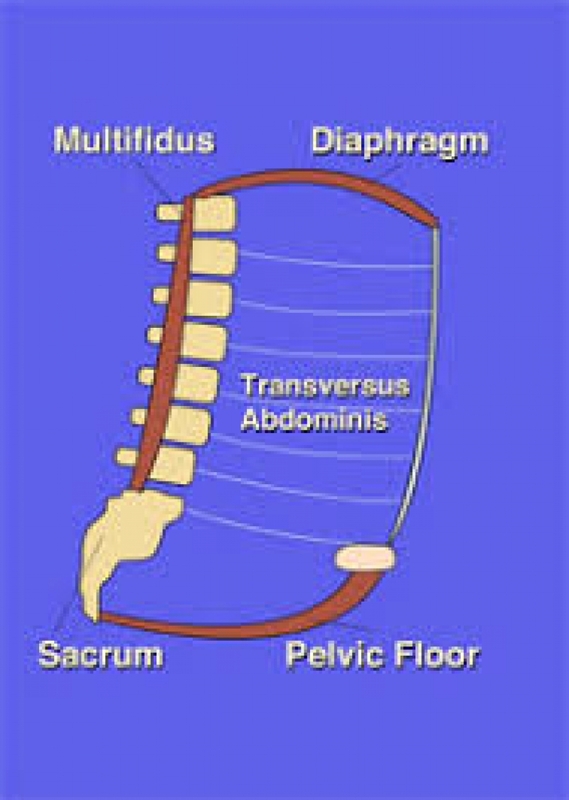 It includes the transverse abdominals, diaphragm, pelvic floor, multifidus and rotatoresrotatores (deep spine muscles), among other deeper tissues. Together, these muscles that lie deeper into your trunk create a cylinder of stability for the spine, so that as you move your arms and legs, the spine is protected from any shearing, friction or excessive strain. When the core is strong and healthy, it has anticipatory properties to them; rather, they will fire to protect the spine before body movement occurs. When the core is not strong and healthy, the anticipatory action of the core is lost, leaving our spine becomes more vulnerable to jarring/twisting movements. For example, as we pick up an object, our hip and knee muscles contract to generate force, while our “core” engages to protect the joints of the spine and prevent shearing/friction/torque to transfer to those areas. The core is our main line of defense against excessive strains on the joints in our back as we move during daily activities. When the core is weakened, or not functioning properly, that line of defense is no longer in place. This means that a simple trunk movement, like picking a sock up off the ground or stepping down off of a step, can disrupt the joint/capsule/muscles/ligament or nerves of the spine. Without the core to protect the joints of the spine, injuries from a shearing/friction/loading force may ensue. Whether suffering low back pain, or simply being proactive, core training should be individualized and help improve your motor control, stabilization, and strength. Core training should be systematic, progressive, functional, and emphasize training of the deep local stabilizing system, then integrating the coordination and use of global muscle systems for optimal functional movements. Core training program should progress to involve variations in: bodyposition, range of motion, amount of control, and speed of execution. The use of stabilizing or balance devices has proven to increase recruitment and benefits of core training exercises. As the exercises progress to fundamental movement skills, they should be progressed to include sport or activity specific movements. Stay tuned for our core exercise sampler blog.